Is Pinterest still a thing that people enjoy? I certainly do and as the evenings get longer and colder here I find myself disappearing into the happy bright place of pinning. I especially like it at this time of year when there are beautiful images to inspire me to make and create for Halloween and even more so for Christmas. I know a lot of people just pin inspirational images but I also like to follow the links to find out more and also discover new and interesting bloggers. 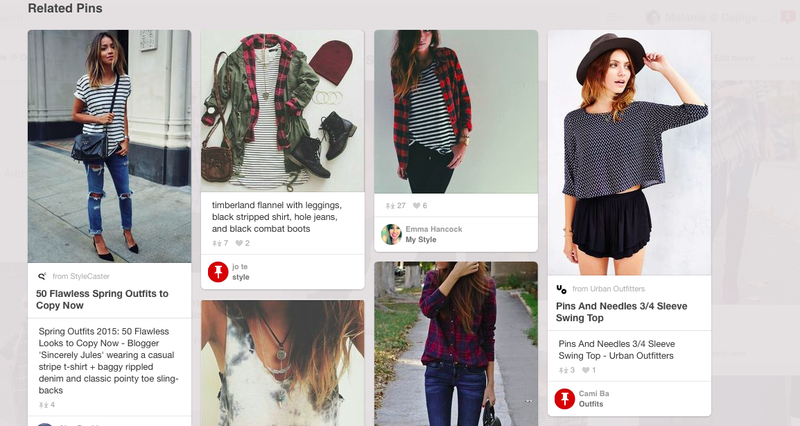 I think a lot of the blogs I follow and enjoy were first introduced to me via Pinterest. Whilst I use Instagram and Twitter as part of my business as well as for pleasure, Pinterest is the place for me. I love that it is a social media that anyone can enjoy, whatever their age, I got my mum well and truly hooked! I use Pinterest on two levels – one is to capture things I like and want to do or be inspired by. I am pinning a lot to my kitchen board at the moment as I am thinking about how we can make our kitchen a better space for our family. I also pin a lot to seasonal boards and also my learning board as my son is very creative and I like to find things for us to do as the winter draws in. The other aspect of Pinterest for me is to tell the story of where I am at the moment so my favourite boards tend to be about Copenhagen, Scandinavian life and also fashion, which is very inspired by the street styles I see around me on a daily basis. Also as above the seasonal boards. My Christmas board is a real snapshot of Danish christmas. Valentina Fussell and Natalie Holbrook are two pinners I really love to look at but there are so many out there to discover. But pinning isn’t just about consuming it is also about adding to the conversation and sharing your pins and inspirations with others. Be clear about what you are pinning and the story you want to tell. Are you crafty or into fashion? Do you enjoy travelling or want to share more about you? I have loads of private boards full of weird and wonderful things that are a bit of a mish mash so I keep my public boards very clear and simple and this means that people know what kind of pins to expect from me. I can also easily find things I want to do or look at again, pinning isn’t just about the pin but about inspiration. Visual Organisation. I have my favourite boards at the top and I move the order around on a seasonal basis. So at the moment autumn, halloween, winter and Christmas are at the top along with my standard fashion and Scandi boards. As soon as someone takes an interest in me on Pinterest they can immediately see the kind of pinner I am and whether they want to follow me. I also make sure the cover photo is one that gives a true representation of the the board. Pinterest is such a visual thing, this is essential. Valentina orders hers alphabetically which is also a great way to do it but she also has a very strong visual brand for her boards so you can immediately see what she is all about. Pin within but also look outside. You need to follow plenty of good pinners in the areas you are interested in and by following you will get followers back plus be very inspired by others. However you also need to look outside Pinterest to keep adding new pins and keep the whole concept of Pinterest alive otherwise we’ll all end up pinning the same pins in a Groundhog Day situation. See something you like online then pin it, no doubt others will like it too. You can add a Pin it button to your browser menu to help with this. Look behind the scenes. Depending on how serious you want to get about Pinterest you should look at the edit board settings and make sure your board is categorised and will come up in searches. I have done this for all my boards but to be honest I don’t think for me it has been that important. I have gained followers by pinning great content not by actively marketing myself. Also don’t try and be clever about your board names especially if you want to be searchable, I love Natalie Jean’s boards but I wonder if her use of triangles is an issue for searches. Also spend a few minutes on your profile so it reflects you and your boards. And it led me to these pins, which I also pinned a few of.. Enjoy it and be authentic. My biggest tip is to just enjoy Pinterest for what it is – a fun place to be. I have almost 2000 followers and this has just come from enjoying pinning, being authentic about what I pin and taking a little bit of time to curate it to make me attractive to fellow pinners. If you have a very visual website or blog think about adding a pin it widget so your readers can easily pin your images.If you are pinning as part of a business strategy remember to stay authentic and look at how other pinners work and not be too ‘business’ about it as it soon turns people off. Pinterest should feel like a cosy place to be not a shouty billboard. But the biggest tip is to keep it fun and not take pinning too seriously. Thanks for the great idea of rearranging boards based on season! I need to do that! I also need to to further classify many of my boards because they are overloaded and can be divided easily.